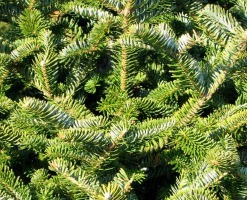 Lehigh Valley’s Largest Selection of Fresh Cut Christmas Trees! only sells quality Christmas trees for your family to enjoy while making lasting memories year after year! Concolor, Abies concolor, commonly known as the white fir or Colorado white-fir, is native to the mountains of western North America, occurring at elevations of 3,000–11,200 ft. It is a medium to large evergreen coniferous tree growing to 80–195 ft tall and with a trunk diameter of up to 6.6 ft. It is popular as an ornamental landscaping tree and as a Christmas tree. These small, narrow needles are around 1 to 1½ in. in length and occur in rows. They have good foliage color, good needle retention, and a pleasing shape and aroma. Douglas-firs are medium-size to extremely large evergreen trees, 70–390 ft tall (although only Coast Douglas-firs reach such great height). The leaves are flat, soft, linear, 0.8–1.6″long, generally resembling those of the firs, occurring singly rather than in fascicles; they completely encircle the branches, which can be useful in recognizing the species. The female cones are pendulous, with persistent scales (unlike true firs), and are distinctive in having a long tridentine (three-pointed) bract that protrudes prominently above each scale (it resembles the back half of a mouse, with two feet and a tail). 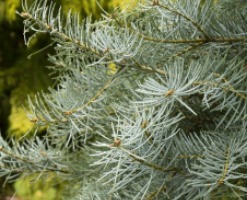 These soft needles are dark green to blue green in color and are approximately 1 to 1 ½ in. in length. Douglas-fir needles radiate in all directions from the branch. When crushed, these needles have a sweet fragrance. 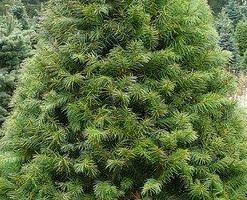 They are one of the top major Christmas tree species in the U.S.
Fraser Fir is a small evergreen coniferous tree growing to between 30 and 50 feet tall (rarely to 80 ft) with a trunk 16 to 20 inches across (rarely up to 30″). The crown is conical, with straight branches either horizontal or angled 40° upward from the trunk; it is dense when the tree is young, but becomes more open as it ages. The bark is thin and smooth, gray-brown with numerous resin blisters on young trees, becoming fissured and scaly with age. The foliage is strongly turpentine-scented. will drill, wrap, and load your special tree for you!